The intricate look of cloisonné with all the details! Delicate white flowers and pink leaves are outlined in gold-tone on soft teal green enamel. Wear this Dogwood Watch & Bracelet Set together or one-by-one. Quartz watch bangle, 2¾"d; bangle bracelet, each 3" dia. Set of 2. Hurry! Quantities are limited! This watch and bangle is perfect and goes so well with many of my outfits and I would highly recommend it. 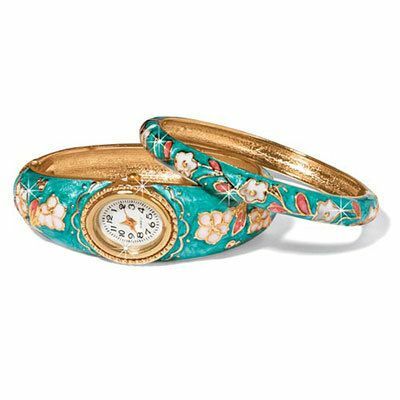 This bracelet set of a watch and matching bangle is lovely, delicate, and affordable. Very nice as a gift for all ages.